When you want to perform Word to PDF conversion instantly, this robust Kernel for Word to PDF conversion software can be the most suitable solution. 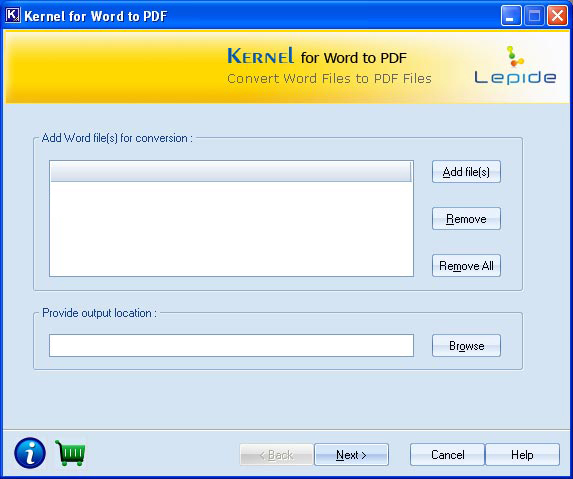 Kernel for Word to PDF is primarily devised to convert word to pdf without affecting the structure and format of the Word file. The best aspect of this Word to PDF conversion software is its ability to recover data, OLE objects, hyperlinks, images and other information from Word files. * Allows you to perform Page Settings to create PDF. Kernel for Word to PDF is an impeccable utility that helps you in managing your important word files and project document files as it converts these .doc files to .pdf format. Converting .doc to .pdf helps you in meeting the data sharing and manageability issues within an organization. Using this software, you can create pdf files and configure encryption as well as local restrictions on the newly-created files. Qweas is providing links to Kernel for Word to PDF 11.02.01 as a courtesy, and makes no representations regarding Kernel for Word to PDF or any other applications or any information related thereto. Any questions, complaints or claims regarding this application Kernel for Word to PDF 11.02.01 must be directed to the appropriate software vendor. You may click the publisher link of Kernel for Word to PDF on the top of this page to get more details about the vendor.